With that, my dreams of breakfast tortas and egg filled Tex Mex style tacos evaporated. I guess that’s what we get for arriving in the early afternoon for brunch. 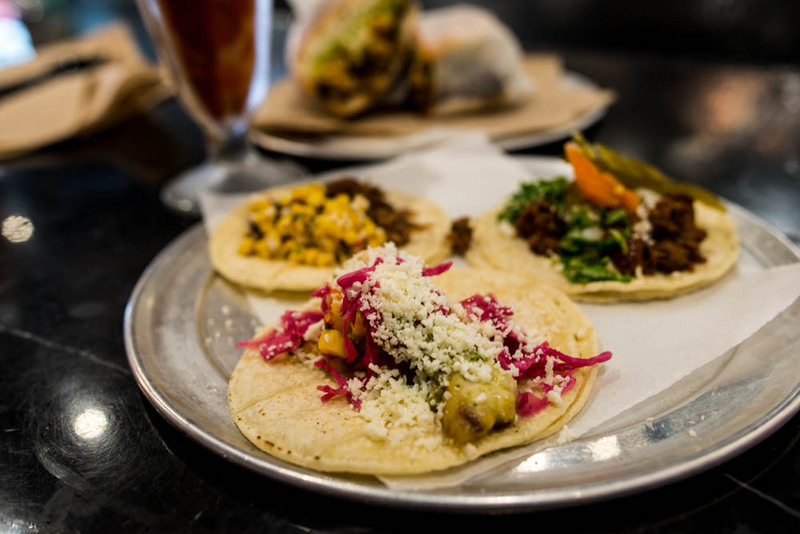 I had been looking forward to them all week ever since I read about the delicious breakfast offerings that Choza Taqueria at Gotham Market West. Why would you not serve breakfast around the clock? It’s baffling to me in particular because I am someone who firmly believes that everything, pretty much everything savory in life, tastes better with an egg on top. 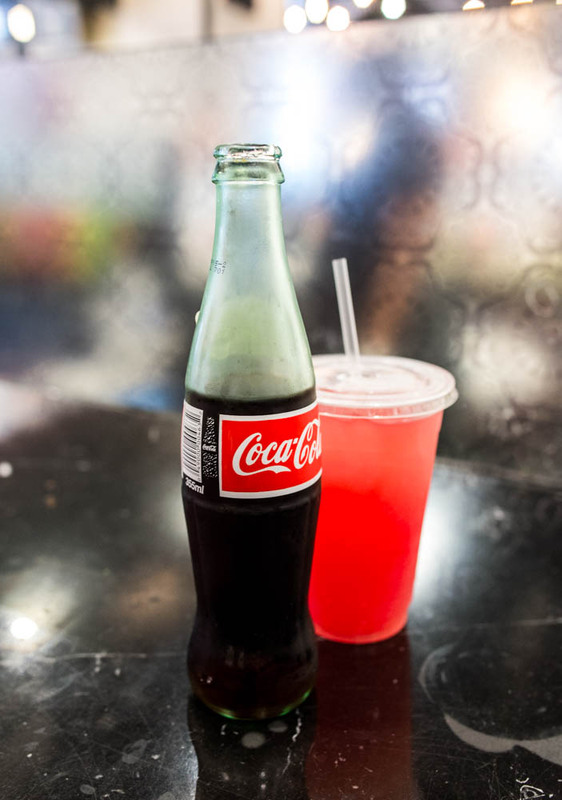 A little disappointed, we settled instead for a selection of tacos and torta sans egg from Choza Taqueria along with a Mexican coke and watermelon agua fresca. 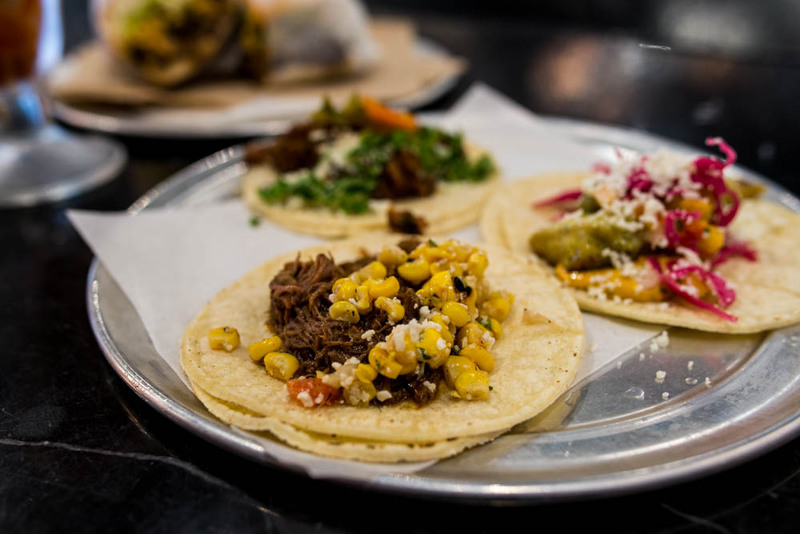 The best part about Choza Taqueria is that you can mix and match the nine different fillings with seven various vessels to deliver them to your stomach. 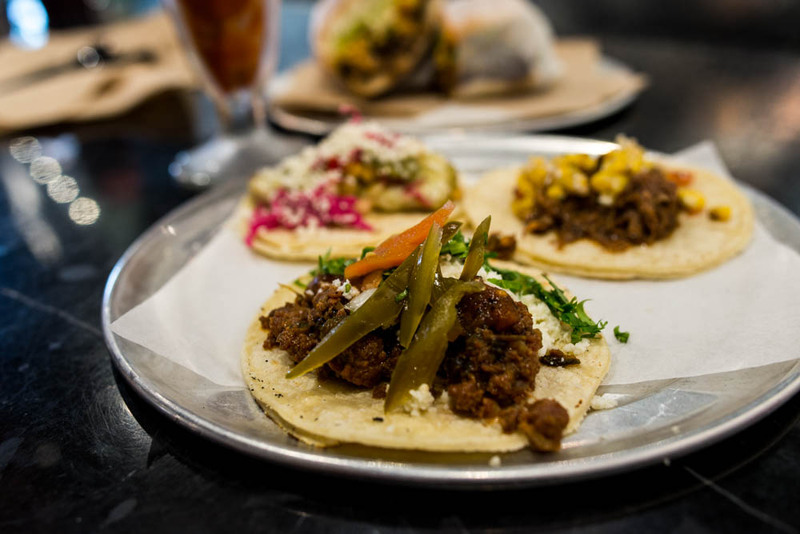 We decided to sample three tacos and one torta, all made with various fillings. Out of the three tacos, we both agreed that the barbacoa was the favorite. Tender pieces of lamb shoulder braised in banana leaf with cinnamon, cumin and garlic were topped with roasted corn salsa and queso fresco. The chorizo was a close second. Crumbles of flavorful sausage came with a mix of ranja, salsa and queso fresco. I kept thinking with each bite how wonderful a little bit of scrambled egg would taste with it. Not that the fish taco wasn’t great, but after the barbacoa and chorizo tacos, the pescado just didn’t quite stand out in flavor. I do appreciate the fact that the fish tacos here came lightly grilled, instead of fried, with pickled cabbage and chipotle cream and mango salsa. 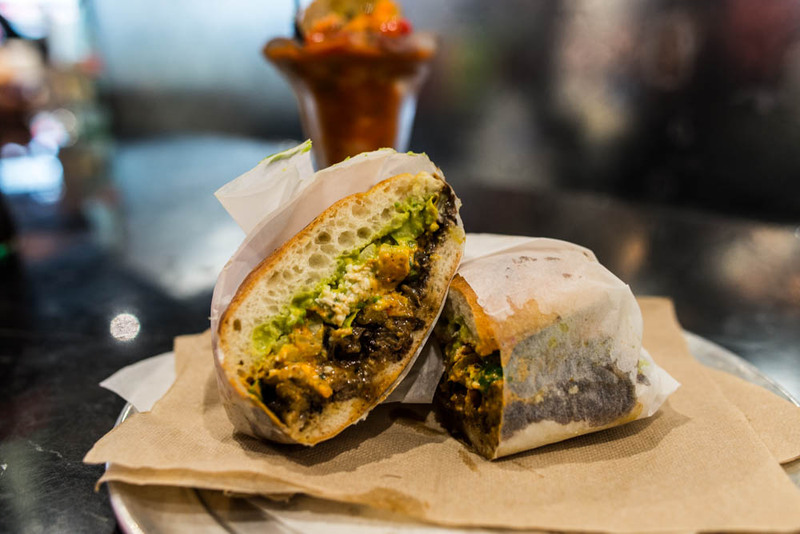 For the torta, we went with carne asada, a wonderful savory mix of grilled steak in a chipotle chili marinade and salsa roja. To round out the sandwich, generous scoops of salsa, guacamole and black bean paste along with cheese and chili cream were tucked into the Telera roll along with the carne. This was one flavorful bite after another that I polished off in no time flat. 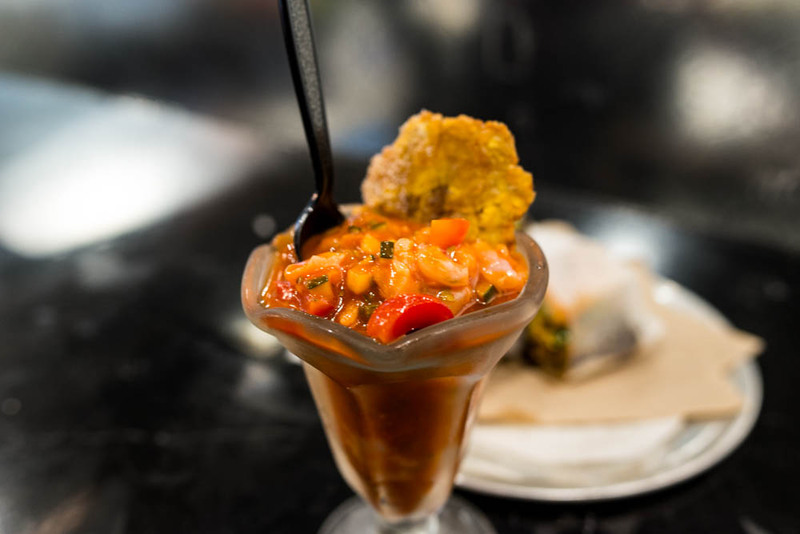 To kicks, we threw in an order of the ceviche coctel as well. Fresh grouper and shrimp were mixed with avocado, lime juice, tomato and serrano peppers. A little too tomato heavy for my taste, the ceviche felt a little too much like a Mexican style cocktail sauce instead of a proper ceviche. Truth be told, even though we ended up having a wonderful meal at Choza Taqueria despite missing out on the breakfast items, I was still sulking a little after the meal. 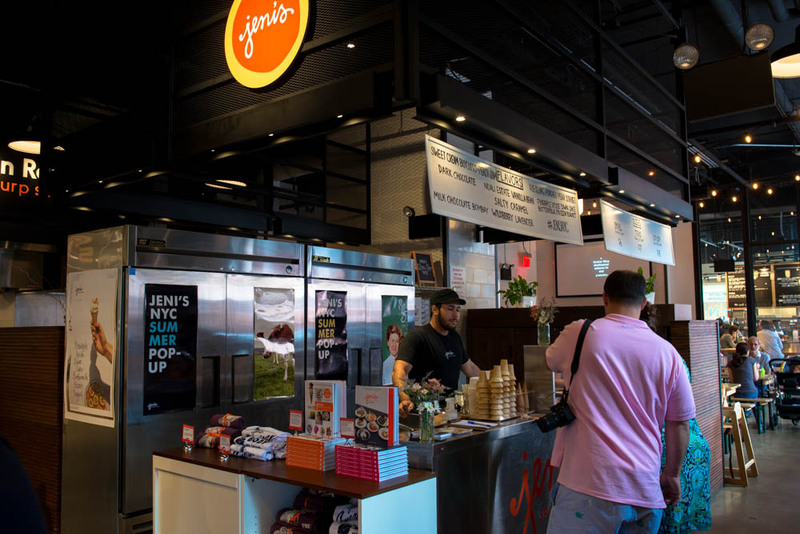 Luckily, Jeni’s Splendid Ice Cream Stand was a few steps away inside the market. In addition to some classic flavors such as salty caramel, they were also serving a special to Manhattan flavor, milk chocolate Bombay. 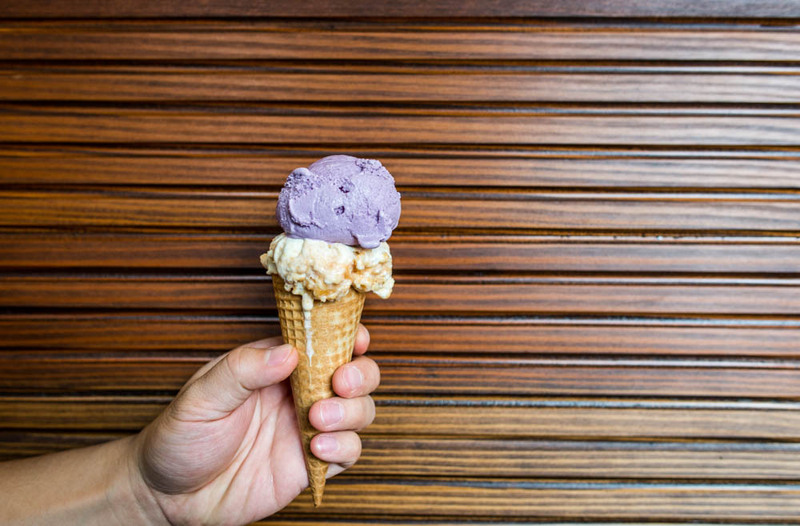 One cone with salty caramel and dark chocolate and another with wild berry lavender and sweet cream biscuit with peach jam please! 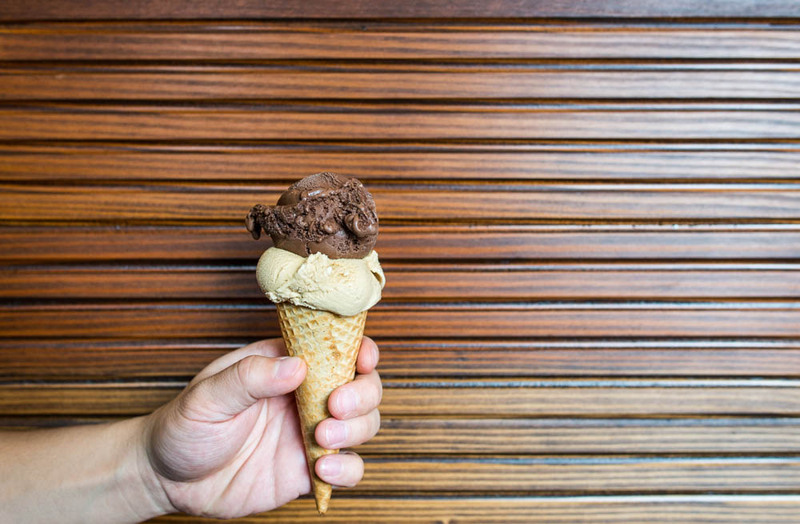 One bite and it was pretty evident why Jeni’s has such a cult following. They were melting fast though so I frantically tried to keep up as I watched my wild berry lavender and sweet cream biscuit with peach jam cone soften in the summer heat, disappointment over missing my breakfast tacos long forgotten.